Fast, customizable and intuitive to use and learn! phpDesigner 8 is for developers who want to create good looking websites, HTML5 apps or just improve their coding skills. 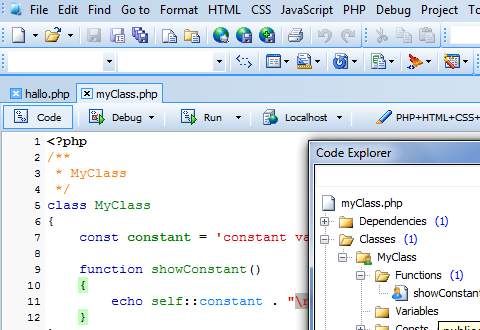 Navigate to classes, functions variables in your files, project and frameworks. Analyze, evaluate, profile, find errors in your PHP code line by line with Xdebug. Built-in code completion for HTML5. It can even suggest you the missing tag. Supports all frameworks for PHP e.g. Zend, CodeIgniter, Yii and Symfony. Supports libraries like jQuery, ExtJS, Yui, Dojo. MooTools and Prototype. Integrated HTML editor with syntax highlighting, code completion, missing tag suggestion, matching tag highlighting and more. Integrated CSS editor - syntax highlighters, code completion, formatter and more. Work directly on your server. Just hit the save button and your work is automatic saved back to the server. Integration with Git the distributed version control and source code management tool. What learning curve? The philosophy behind is to make it, enjoyable to code for hours through an easy-to-use-, intuitive- and customizable workspace. It’s so intuitive and easy to use that you can get started right away. phpDesigner 8 is now compatible with Windows 8 (32-bit and 64-bit). phpDesigner 8 is also available in a portable "USB" edition. Work with your code wherever you go! 1,500.000+ downloads in 100+ countries. Meet the users — more testimonials. I've been using phpDesigner for almost a year now and it's really easy to get into and use. I work a lot with different CMS-platforms and do adjust them to my needs and phpDesigner makes this child's play. I just recently bought the Portable Edition so I can use the program when I'm not home. I recommend this to everyone who's into web development, be it a beginner, expert or professional. Since version 5.2 it supports PHP5 Keywords, the only think I was missing before. And by now it can easily compete with Zend or Eclipse. Thanks for this great IDE!